A floral flavour of the USA will be showcased at the Royal Horticultural Society (RHS) Hampton Court Palace Flower Show (3rd to 9th July 2017) with three gardens designed by Sadie May Stowell. Brand USA, the destination marketing organization for the United States, together with Explore Charleston, Travel Oregon and The Beaches of Fort Myers and Sanibel, are sponsoring the gardens. The show will also mark the first time a designer will design three show gardens simultaneously at the event. One garden will see Sadie seek to capture the essence of the historic Moonlight Garden of the Edison & Ford Winter Estates, the former homes of Thomas Edison and Henry Ford, in Fort Myers, Florida. The second garden – the Charleston Garden, depicts the romanticism of the famous hidden gardens and iconic Waterfront Park of Charleston, South Carolina. The third garden – The Oregon Garden – captures the natural beauty of the landscape and gardens of Oregon taking inspiration from its mountains and Japanese-style gardens. The Charleston Garden (banner above) will offer a sense of history in this sub-tropical creation with design featuring a scaled down replica of Charleston’s famous pineapple water fountain. 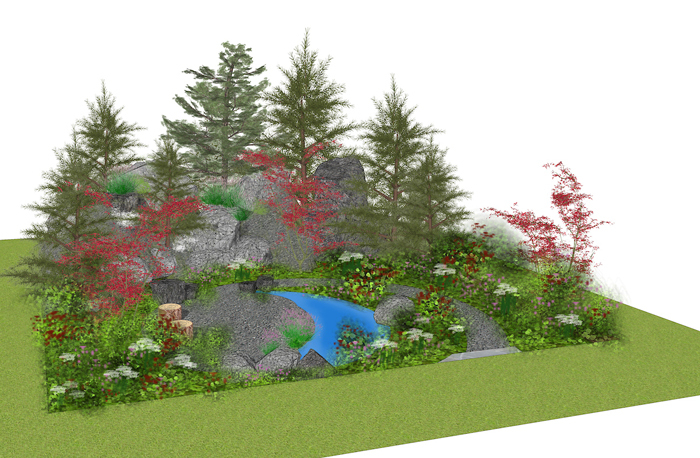 The centerpiece of the Oregon Garden (above) takes its inspiration from its mountainous landscape and Portland’s International Rose Test and Japanese Gardens. The planting will contain shrub roses in a rich tapestry of deep reds and cream as found in the Portland International Rose Test Garden, which is this year celebrating its centennial. The Florida Garden captures the character of the Edison and Ford Winter Estates, in particular the historic Moonlight Garden designed by Ellen Biddle Shipman, the first female landscape architect in the United States.